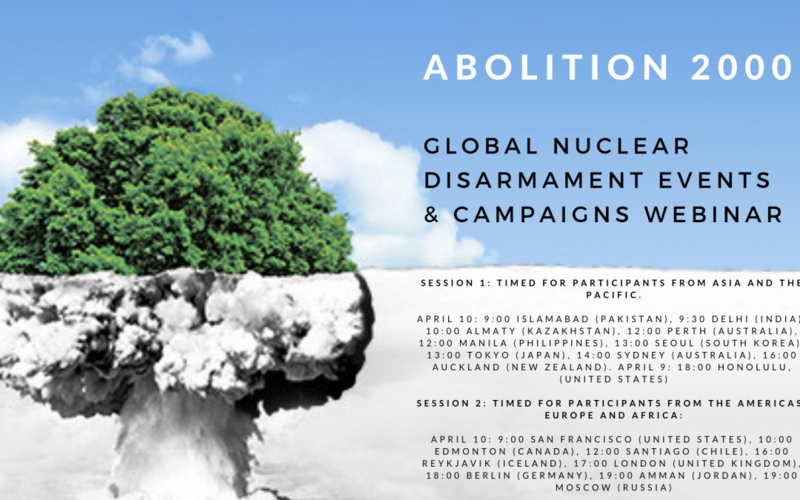 The webinar will provide an overview of nuclear disarmament processes and events happening in 2019, and the main nuclear disarmament campaigns and actions by parliamentarians, mayors and civil society. The webinar will introduce Abolition 2000 working groups, campaigns and affiliated networks, and it will provide opportunities for activists to discuss and/or join various campaigns and events. Click here to register. The webinar is the second in a series of such webinars being organized by Abolition 2000, the first one being in January 2019 on the INF Treaty. The webinars are open to anyone involved in nuclear disarmament or wanting to get involved. The webinar will be held in two repeating sessions: Session 1 is scheduled to enable participation by those living in Asia and the Pacific. Session 2 is scheduled to enable participation by those living in the Americas, Europe and Africa. Each session will last for 1¾ -2 hours using the Zoom conferencing platform and will include a short technical introduction to the zoom conferencing functions, in addition to the presentations, discussion and conclusion. Session 1: Timed for participants from Asia and the Pacific. Tamkeen Saeid (New Zealand), The Peace Foundation. Youth actions. Monica Willard (USA), United Religions Initiative. Interfaith actions and events. Please click here to register online. Once you register we will send you details about how to connect to the webinar via zoom. For more information visit www.abolition2000.org or contact [email protected].